Möchtest du dein Reiten durch tägliches Arbeiten mit “Top-Professionals” und qualitätsvollen Dressurpferden verbessern? Das Dressurteam auf Hof Börnsen bietet ein vielseitiges und individuelles Praktikumsprogramm (6-12 Monate) für pferdebegeisterte Reiter aus aller Welt an. Im Austausch für deinen Einsatz bekommst du Unterricht auf hochklassigen Dressurpferden. Deine Chancen und Möglichkeiten zu reiten werden an deiner Erfahrung und Entwicklung innerhalb deiner Praktikumszeit gemessen. Die Teilnahme an Turnieren ist möglich und kann individuell besprochen werden. Für unsere Praktikanten ist eine Wohnmöglichkeit vorhanden. Sie können an Events und Freizeitaktivitäten teilnehmen. Falls du Interesse hast, ein Teil unseres Dressurteams zu werden, kontaktiere uns gerne per Mail unter hbdressur@hofboernsen.de. Wir würden uns freuen, dich besser kennen zu lernen und deine Möglichkeiten zu besprechen. Would you like to improve your dressage skills by working with top professionals and quality horses every day? 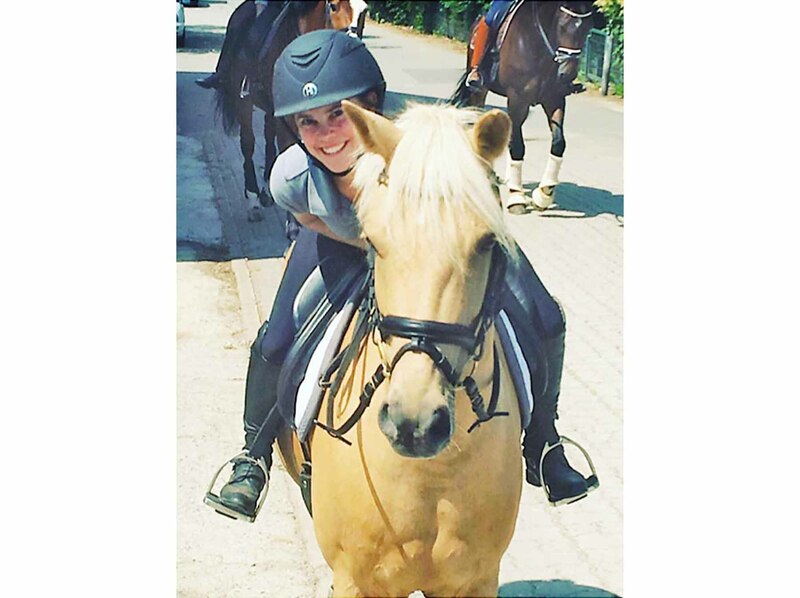 The dressage team at Hof Börnsen offers a versatile and individualised internship program (6-12 month) for young riders from all over the world. Essentially, in exchange for your assistance, you will receive intensive lessons on well-trained dressage horses in a top class facility. Your chances and opportunities for riding will be determined by your experience and progress during your internship. Your participation in tournaments on our horses is possible and can be discussed individually. Our interns receive living accommodations and also the opportunity to participate in horse-themed events and leisure activities. If you are interested in being a part of our dressage team, please contact us via email hbdressur@hofboernsen.de. We would be delighted to get to know you better and discuss your possibilities. Ich habe bereits mehrmals ein Praktikum auf dem Hof Börnsen gemacht. Ich habe geholfen die Pferde fertig zu machen und durfte auch selber verschiedene Pferde reiten. Durch die tägliche Begleitung von Sven und Judy konnte ich viel von den Pferden lernen und mich dadurch reiterlich verbessern. I heard about the boutique stable in Börnsen from my riding instructor. I felt as though my riding was poor and I was sick of not being able to reach the top five in competition. I had ridden dressage but my main focus was on eventing. My goal was to reach 1* on a horse that I had trained myself, but I knew this was not possible without the training. So I left Australia at the age of 28, leaving behind my career and pets and set off on a trip of a life time. On my first day at Hof Börnsen, Judy asked if I was ok to ride and I jumped to it. I was so excited not realising what I was up for. The first horse I rode required a lot of leg; I struggled to get him in to a canter. With my legs flapping my arms flying, I realised this was going to be harder than I thought. As the weeks went on I rode different types of horses, ranging from Ponies, Breakers, schoolmasters and horses that required special attention. And I fell in love with one of the schoolmasters. He taught me that if I was not sitting correctly or if my aids where not clear enough then the movement I was asking for would not be evidenced. Over the 6 months of living in Germany, my riding started to change dramatically. I went from a Pony Club rider to someone who was able to use a double bridle the correct way. At Börnsen, you are not just taught how to go round on a horse: Judy and Sven focus on your position because without the correct position you cannot achieve the movement you want. They have a passion for soft supple horses and you are taught the easy and effective way to achieve this. After I came home, I worked hard with my horse, still having the goals that I set when I left. I took my horse slowly and worked carefully on the basics. Last year with 50 riders in each class, I was always placed in the top 5. This year my goal is to ride at 1* with a horse I have brought along myself. This would never have been possible without the incredible team at Börnsen. Judy and Sven: it is an absolute credit to you both to be able to take amateur riders on and be able to turn them into something great. I will always be forever grateful. Being at Hof Bornsen was incredible for me because of the opportunity it provided to experience the horse industry in Germany. I had one-on-one help from Judy and Sven with several horses in regards to riding and training over the time I was there. I also got to see top notch horse sales. Attending the shows was amazing because we saw many top competitors and even Olympians from all over Europe. Not to mention just being in Germany allowed me many new an exciting experiences, from their fairs to their food and everything in between. I am grateful that Sven and Judy made this a positive opportunity for me.